What exactly is Six Sigma? A lot of people have heard of it, rather fewer have more than a hazy idea about it – and those that do have often only been exposed to just one element of it. This is understandable since, unlike any other approach, it can truly affect every person and every function in an organisation. It’s also possible to pick at Six Sigma and take only those pieces of the jigsaw that are appealing or appear easy. The purpose of this note is to show the whole jigsaw and how the various pieces fit together. So, why Six Sigma? Strictly speaking, it’s nothing more than a measure of quality quoted as a sigma level. Statisticians talk about standard deviation (for which they use the Greek letter sigma), to quantify variations from the norm on a standard bell curve graph – typically a 1-sigma result would indicate that 68% of output met the expected standard; a 2-sigma result would be 95%; a 3-sigma result 99.7%, and so on. On this sliding scale a 6-sigma result would indicate no more than 3.4 defects for every million opportunities. Back in 1986 Motorola set a 6-sigma result as a goal for all their manufacturing operations and twenty years later estimated that by doing so they had saved more than US$17 billion. As other companies adopted the same approach they used the same target, so the approach itself became known as Six Sigma and a 6-sigma result came to be used as a definition of world class performance. Since Six Sigma is a statistically based concept of quality, it is universal and absolute. Unlike other approaches to quality management, it can be applied throughout an organisation. It applies equally to measuring the performance of an accounts or HR department as it does to product or service quality. It can apply equally in a transactional or service organisation as well as a manufacturing organisation. We can therefore talk about a 4-sigma product or a 3.8-sigma service. The first recognises that significant improvement can be made by taking what we have and improving it. The second recognises that the way in which we designed what we have limits our ability to achieve the Six Sigma target. To achieve Six Sigma requires products and processes that are designed with this in mind. Many organisations that have adopted just the Six Sigma process improvement methodology come up against the 5-sigma barrier, which can only be broken through with the use of Design for Six Sigma. And where does ‘Lean’ come into it? ‘Lean manufacturing’ or ‘lean production’ became buzzwords in the 1990s as western companies sought to understand the success of Japanese manufacturing, based largely on the Toyota production system which aimed to eliminate all kinds of waste. Sharing the same overall objective as Six Sigma, about ten years ago some practitioners therefore started talking about Lean Six Sigma. Purists, however, stick to Six Sigma, without the Lean. Executive Leadership (the senior management team) set the vision for Six Sigma implementation. Champions take responsibility for implementation. Drawn from upper management, they also act as mentors to Black Belts. Master Black Belts, identified by Champions, act as in-house coaches on Six Sigma. They devote 100% of their time to Six Sigma. They help Champions and guide Black and Green Belts. Black Belts work full-time under Master Black Belts on specific Six Sigma implementation projects. Green Belts have part-time responsibilities for aspects of Six Sigma implementation, under the guidance of Black Belts. A Yellow Belt doesn’t feature in this official hierarchy but is the term used informally for those team members who have some entry-level training on Six Sigma so that they can support those team members responsible for its implementation. There is no single certification body for Six Sigma, so there’s no one organisation that polices use of these belts but it is universally understood that the belts are awarded on completion of the relevant training and that the training can only be delivered by Master Black Belts. The need to maintain discipline and progress during projects is essential and for this reason a project management process supports the project process. This comprises project sponsorship and phase reviews to ensure all key phase activities have been performed and that the outcomes are acceptable. Six Sigma is a data-driven approach and the review of evidence-based deliverables guarantees that project decisions are appropriate to the business. Green Belts are suitable staff members who have been trained in the Six Sigma project process and tool set. They typically lead one project at a time and spend 1 or 2 days per week on their project. Black Belts are staff members who have been trained in the Six Sigma project process and tool set. They are full-time and can lead two projects at a time. They also act as mentors for Green Belts and receive additional training in the use of statistical tools and mentoring skills. It is also recommended that a Six Sigma Leader or Master Black Belt provides mentoring for the Black and Green Belts as well as specialist support. Master Black Belts are also responsible for training other Belts. A Master Black Belt is normally an experienced Black Belt who receives extra training to carry out their additional roles. To ease the implementation of Six Sigma it is common to train some team members in the project process and simple tools. These part-time team members are frequently referred to as Yellow Belts. The last and most important role is that of Champion. Champions sponsor Six Sigma projects and conduct the corresponding phase review. Their role is therefore to monitor progress and, where necessary, provide authority and support to ensure that projects are successful. For these reasons it is recommended that Champions are senior executives in the organisation. It cannot be over-emphasised how pivotal Champions are in achieving success with Six Sigma. The evidence clearly shows that those organisations who do not take the Champion role seriously fail to deliver project success. Champions and Belts need to have a good working understanding and knowledge of the processes and tool set. This makes the training of Six Sigma staff essential. The training should be Just-In-Time and aligned to the implementation of Six Sigma and to the projects. The recommended implementation approach is outlined below. Six Sigma is an extremely powerful approach to quality improvement. Success, however, is dependent on how it is introduced into an organisation. Based on past experience, we have developed an implementation process and approach that will lead to a mature Six Sigma organisation. This note gives an overview of that approach, It involves an introduction process together with a number of pre- and implementation conditions. These ensure that Six Sigma becomes embedded within the organisation – ‘the way we do things here’. All of these are aligned with existing strategy, processes and initiatives. We would be happy to talk you through this process in more detail: simply give us a call on 01582 714280 and we’ll set you up for a conversation or meeting with our lead consultant in this area, Master Black Belt Bill McIntyre. We offer a broad range of qualification programmes (the belts) as well as a number of workshops which can be run on a more ad hoc basis to support efforts in specific areas. There is sometimes a thin dividing line between training and consultancy and this applies particularly to some of these ad hoc workshops, so do please give us a call if you have any questions as to what might be the best approach for your particular situation. Full details below or download our programme portfolio. 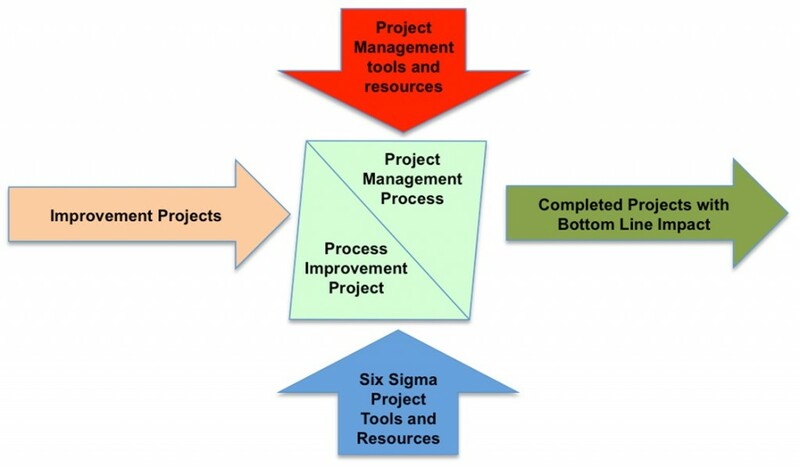 As outlined above, successful implementation of Six Sigma requires a strong focus on project management. Our Goal-directed Project Management programme has been developed specifically with Six Sigma projects in mind. Business Assessment Profiling programme was designed very much with that particular audience in mind. Business assessment profiles assess, amongst other things, the extent to which the organisation’s products or services are aligned with its customers’ requirements: if there is a gap, then Quality Function Deployment (QFD) is a technique that can be used to turn customer needs into engineering characteristics and test methods. Statistical analysis is often just the start of a process of identifying possible issues, analysing and then dealing with them. Failure Mode and Effects Analysis (FMEA) is a much-used technique in reliability engineering, safety engineering and quality engineering which can help identify quality issues. Identifying quality issues is one thing, solving them quite another. The Structured problem-solving programme takes a workshop approach to mastering a formal methodology for the solution of quality improvement problems. All these techniques are crucial tools for Six Sigma process improvement projects. The other strand of Six Sigma projects, as mentioned above, is of course Design for Six Sigma, which is under-pinned by a number of formal approaches that lend themselves to a workshop-based explanation. Turning to Lean, the core programme, Lean Practitioner, is an immersion-style programme which gives people all the background knowledge, tools and techniques they need in order to initiate a Lean programme within their organisation. Value stream mapping is one of the tools most commonly used in Lean continuous improvement programmes to help understand and improve the material and information flow within organisations. Also called process mapping, it leads naturally to Rapid improvement events – the brief programme outline below is designed as the first part of a facilitated workshop to model the technique which can then be applied internally without any further need for external support. We would be happy to talk you through your training requirements in more detail: simply give us a call on 01582 714280 and we’ll set up a conversation or meeting for you with our lead consultant in this area, Master Black Belt Bill McIntyre.